Area navigation (RNAV) is a general term used to describe the navigation from point A to point B without direct over flight of navigational aids, such as VOR stations or ADF nondirectional beacons. It includes VORTAC and VOR/DME based systems, as well as systems of RNAV based around LORAN, GPS, INS, and the FMS of transport category aircraft. However, until recently, the term RNAV was most commonly used to describe the area navigation or the process of direct flight from point A to point B using VORTAC and VOR/DME based references. All RNAV systems make use of waypoints. A waypoint is a designated geographical location or point used for route definition or progress-reporting purposes. It can be defined or described by using latitude/longitude grid coordinates or, in the case of VOR based RNAV, described as a point on a VOR radial followed by that point’s distance from the VOR station (i.e., 200/25 means a point 25 nautical miles from the VOR station on the 200° radial). Figure 1 illustrates a RNAV route of flight from airport A to airport B. 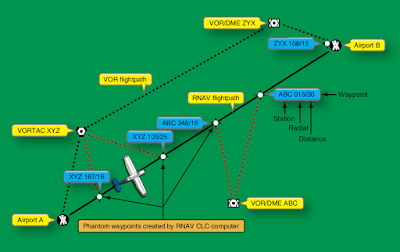 The VOR/DME and VORTAC stations shown are used to create phantom waypoints that are overflown rather than the actual stations. This allows a more direct route to be taken. 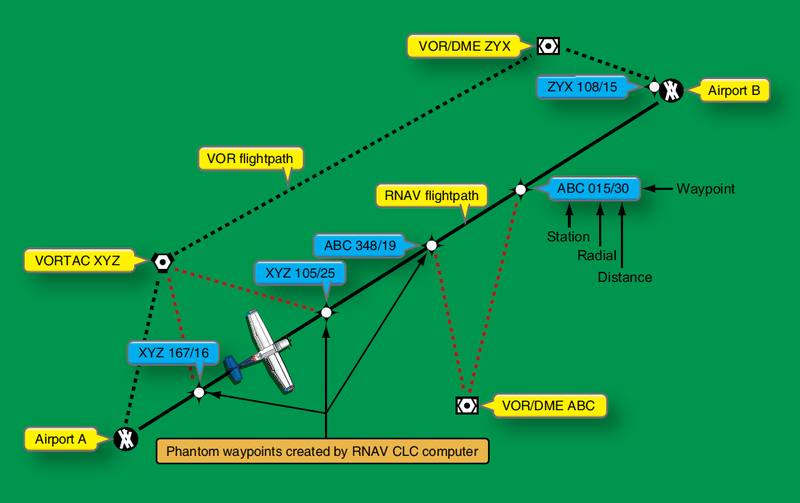 The phantom waypoints are entered into the RNAV course-line computer (CLC) as a radial and distance number pair. The computer creates the waypoints and causes the aircraft’s CDI to operate as though they are actual VOR stations. A mode switch allows the choice between standard VOR navigation and RNAV. RNAV has increased in flexibility with the development of GPS. Integration of GPS data into a planned VOR RNAV flight plan is possible as is GPS route planning without the use of any VOR stations. A radio altimeter, or radar altimeter, is used to measure the distance from the aircraft to the terrain directly beneath it. It is used primarily during instrument approach and low level or night flight below 2500 feet. The radio altimeter supplies the primary altitude information for landing decision height. It incorporates an adjustable altitude bug that creates a visual or aural warning to the pilot when the aircraft reaches that altitude. Typically, the pilot will abort a landing if the decision height is reached and the runway is not visible. 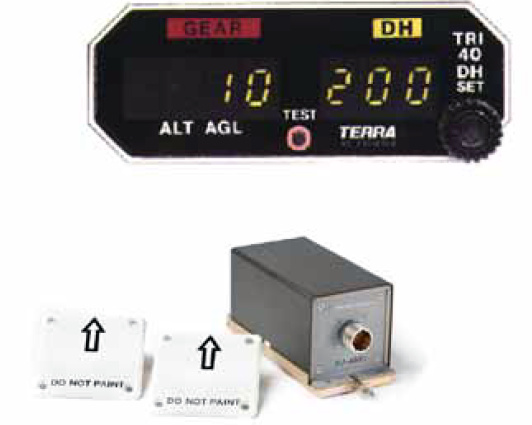 A digital display radio altimeter (top), and the two antennas and transceiver for a radio/radar altimeter (bottom). A radar altimeter is more accurate and responsive than an air pressure altimeter for AGL information at low altitudes. The transceiver is usually located remotely from the indicator. Multifunctional and glass cockpit displays typically integrate decision height awareness from the radar altimeter as a digital number displayed on the screen with a bug, light, or color change used to indicate when that altitude is reached. 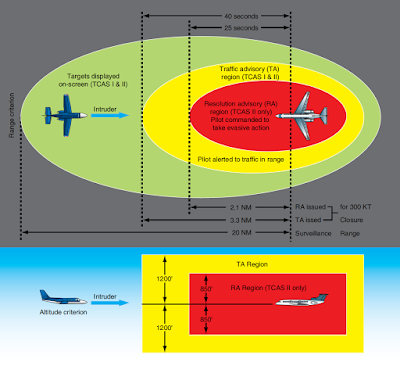 Large aircraft may incorporate radio altimeter information into a ground proximity warning system (GPWS) which aurally alerts the crew of potentially dangerous proximity to the terrain below the aircraft. 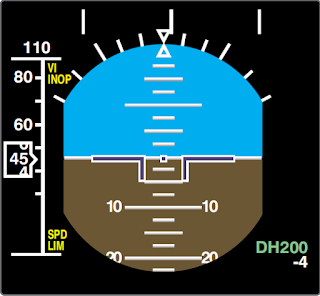 A decision height window (DH) displays the radar altitude on the EADI in Figure 4.